The temperature has been steadily dropping over these last days of autumn, and today the mercury didn't reach double figures, languishing around the eight degree mark. With winter on the doorstep, it's perfect weather for curling up in front of the fire. But the lure of one last fruit picking adventure was too hard to resist. Especially one as clandestine as scrumping, that is fruit looting, or ahem, stealing apples off the trees without permission from the owner. Up into the hills and along an old dirt road stands an overgrown abandoned apple orchard. There were hundreds of kilos of apples rotting on the ground, with plenty more still stubbornly clinging to the gnarly, moss covered trees. 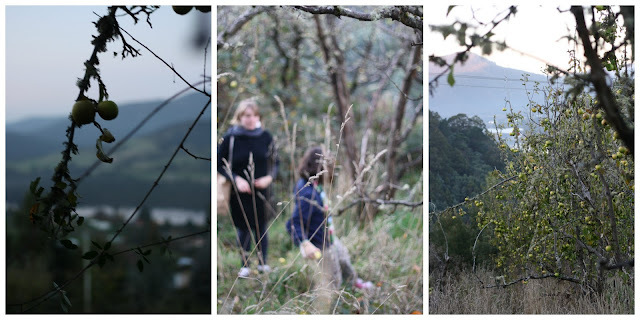 Despite the steep hills, thick grass and lots of brambles we had to battle to get in there, the prize of biting into those cold apples in that fresh mountain air was utterly delightful. We picked at least 20 kilos of granny smith's and tiny golden delicious, and would have picked more if we could reach the higher apples. We hauled our heavy baskets back down the road, whilst we stuffed our faces with crunchy sweet apples. Tomorrow I'll make apple sauce, apple jelly and apple butter with the loot. Apple scrumping, stealing perhaps, but a late autumn activity of the very best kind. I love the word scrumping! It sounds like the perfect word for foraging abandoned fruit. I would be in heaven if I came across an old orchard. I woud love a good recipe for apple butter. oh what delightful fun! and I am sure an adventure beloved by your children! I just adore old orchards and your photos create such longing in me. It is a delightful world. Rob longs for the day when his apple orchard is producing well. It's hard to wish parts of our lives would speed up and others slow down! Would love to know your apple butter recipe. Better that all that delicious fruit be used and appreciated than rot on the ground! We did a bit of our own citrus scrumping yesterday. Piles of limes, mandarins and oranges on the ground. I was lamenting how much fruit there is in long forgotten orchards around here that goes to waste. Scrumping- what a delightful word! And so much better that you use those apples than let them rot. Beautiful photos. As children we used to scrump apples by positioning our ponies under the trees and standing up on the saddles to reach the fruit. We soon learn that it was best to drop a few apples for the ponies at the start otherwise they wandered off and we fell off. Looks delicious. I just picked some abandoned kale for dinner! Such a shame to see it go to waste and not in my belly. Lovely photos, I took some very similar ones recently of collecting apples but from our own tree this time. The foraged apples were earlier in the year! Sounds like my perfect weekend activity!! The excitement of 'stealing' (but not really) and making something wonderful out of fruit that would have rotted on the ground. We managed to get half a bucket of the last of the apples from the tree in the garden. the cool weather and frosts really sweetens them. all that apple cooking sounds like the perfect autumn kitchen activity. A 'forgotten' apple orchard....what a wonderful discovery!